Booking Steve Spangler is a guarantee that you’re getting a media-savy expert who knows how to turn the content you want into a visually exciting experience your audience will love. He’s not the nerdy scientist in a lab coat with experiments that produce ho-hum results. Steve Spangler has over 1,300 television appearances to his credit (and a few Emmy awards on his nightstand) that make him your go-to guy when you need a guest who knows how to effectively use television to produce the results you want. Let’s face it… many science experts come across as awkward and uncomfortable on television. In contrast, Steve’s casual appearance and level of comfort in front of the camera immediately puts your show host at ease and creates a fun and relaxed learning environment. He’s been described as the science teacher you always wanted to have in school with a passion for making science fun. Steve Spangler is a leader in the STEM education movement with over 100 million views of his popular Sick Science® videos on YouTube and syndicated on networks worldwide. His efforts to inspire today’s youth to seek out careers as scientists and engineers are at the forefront of his work in schools and corporations throughout the country. Featured on the History Channel, Food Network, HGTV, Discovery Channel, as a regular guest on The Ellen DeGeneres Show and as a science education reporter at KUSA in Denver, Steve knows what top producers want and how to deliver the content in the most exciting, visual way possible. If you’re looking for someone who is an expert at using the media to communicate his passion for making learning fun, Steve Spangler is the perfect guest. 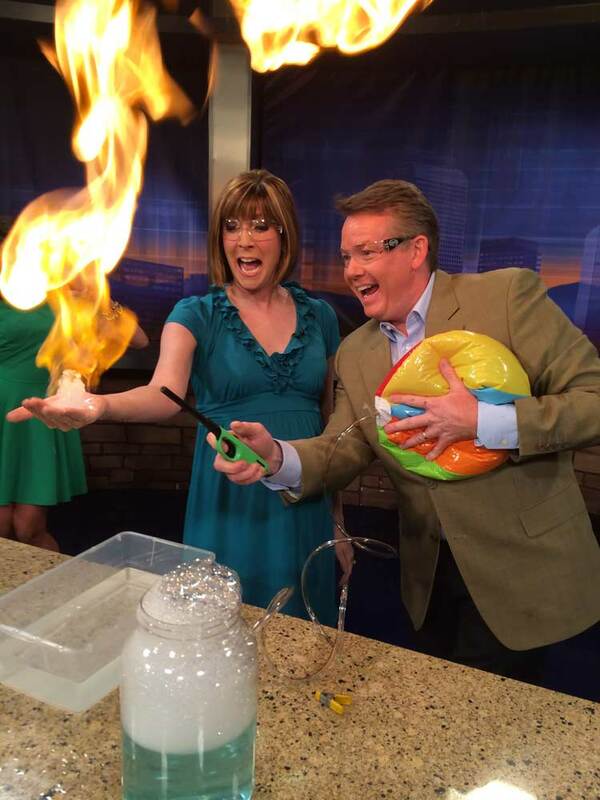 Besides… his cool science demos are always a hit! Steve has a unique way of communicating complex concepts in a style that is both highly visual and very entertaining. This Emmy award-winning talent has nearly 1,300 television segments to his credit… and he’s always up for a new and exciting challenge. Responsible for teaching millions of people how to turn an ordinary bottle of soda and a roll of MENTOS in to an erupting soda geyser. His now famous Mentos Geyser Experiment became an Internet sensation in September of 2005 and was one of the first viral videos on YouTube. The recipient of two Heartland Emmy awards (1997 and 2010) for his work in news and educational programming. A regular guest on the Ellen Show with 15 appearances to his credit (as of December 2013). The founder of a company called Be Amazing Toys, which began in 2002. As the head of product development, Steve is the author and creator of over 140 books, toys and science kits distributed to toy stores and mass-market retailers worldwide including Target, Toys R’ Us and Walmart. A Guinness World Record holder for conducting the world’s largest physics lesson in May 2009. From a family of professional magicians. His father, Bruce Spangler, was a consultant to many of the top names in magic including David Copperfield and Penn & Teller. As a child, Steve helped his parents package and sell small bottles of fake blood (a patented formula that was marketed to high-end television and film studios in the 70s and 80s). A former elementary science teacher (for eleven years) and continues to serve as a science education consultant to the Littleton Public Schools in Colorado. A Speaker Hall of Fame inductee as of 2010. One of Steve’s mottos is… “If it gets to the dinner table, you win.” If teachers create unforgettable experiences, kids will talk about them at the dinner table. Find out more about Steve Spangler’s availability for media appearances—contact Carly Reed at 1-855-228-8780.